Just last month I celebrated my one-year work anniversary. Since hitting that milestone, I’ve done a lot of reflecting on what I’ve learned over the past year. As part of that, I’ve put together a list of tips I’d like to share with this year’s crop of new DPTs just starting their first jobs as physical therapists. 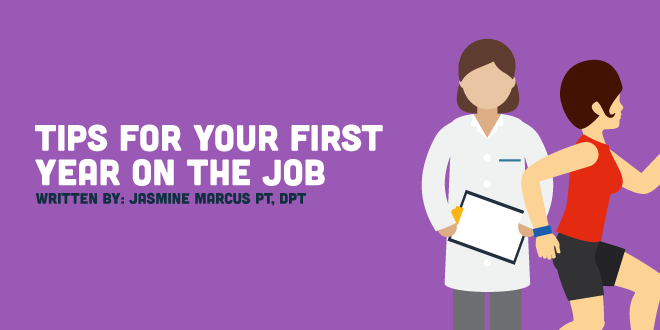 These tips are meant to make your first year as a physical therapist as smooth a transition as possible. Just because school is over doesn’t mean your education ends. Thanks to the encouragement of my co-workers, I’ve already taken two continuing education courses in the past year. However, I also make sure to keep learning on a daily basis. I follow several physical therapy blogs and websites, and when I come across an interesting post or article, I bookmark it. Then when I have a break in my schedule, I can fill my time productively by reading and reviewing. As a new PT, everything is new. This sounds obvious, but there comes a point when you realize that even though you saw dozens of knee replacements as a student, you’re suddenly treating a patient with a new knee for the first time independently. After a year, I’m constantly treating common (and uncommon) injuries or conditions that I just haven’t happened to see yet. When this happens, I try to review my notes and articles and ask colleagues for suggestions. Even if it’s my first time treating something, I want to be as prepared as if it were my 10th. Luckily at my clinic, there are a few experienced clinicians around who are always open to answering questions or reviewing techniques. When needed, they’re always available to co-treat a patient to give you a second opinion when needed. Every once in a while, it helps to get a second set of eyes on a patient when you get stuck or mystified. One of the best parts of my day can be bonding with my co-workers. Besides asking for advice on treating patients, it’s fun to have someone to chat with during lunch. And since I relocated after graduate school, my co-workers were the first friends I made in town and are constantly giving me ideas for new things to do when we’re not working. When patients run late, and the documentation takes forever, it helps to pause for a minute to talk to someone who understands exactly how you’re feeling. Now that you’re done with school, you’ll have a lot more free time on your hands. It’s tempting to come home and watch TV every night, but even that gets boring. To recharge after work, I’ve taken up various exercise and circus classes. I’ve also sampled classes that my patients have mentioned just to get a better understanding of the goals they’re trying to meet, which is how I found myself in a Jazzercise class last month! These hobbies give me something to talk about with patients, but more importantly, help give me something to think about and look forward to besides work. As a new physical therapist, start learning about the here.